news New South Wales’ Coalition State Government late last week revealed a new and wide-ranging strategy which it said was slated to make it “the leader in ICT” when it came to public sector service delivery and the development of the state’s technology sector as a whole. The state has also established an ICT Board comprised of directors-general of departments and agencies from across the NSW public sector, which will be responsible for overseeing governance of technology-driven projects. It is chaired by Michael Coutts-Trotter, director-general of the Department of Finance and Services, and also, formally the state’s chief information officer. Coutts-Trotter also chairs an ICT Leadership Group which is comprised of CIOs and other executives from across the state’s public sector. An ICT Advisory Panel composed of industry and research sector representatives reports to the ICT Board, and a number of smaller ICT Working Groups reports to the ICT Leadership Group. In a statement last week associated with a form where 300 ICT industry representatives were briefed on the strategy, NSW Deputy Premier Andrew Stoner and Minister for Finance and Services Greg Pearce emphasised the NSW Government’s desire to become a leader when it came to technology. Pearce added that the strategy — which would target 85 different actions across 17 major initiatives — would “bring NSW out of the dark ages and into the 21st century”, noting that citizens would see the difference in service delivery as the strategy was implemented, due to the public-facing transport apps, disclosure of government information and centralised Service NSW strategy being rolled out. It’s not the first time that the NSW Government has unveiled a wide-ranging IT strategy. In mid-2006, the state’s then-chief information officer, Paul Edgecumbe, outlined a $565 million savings strategy to consolidate state government technology infrastructure, with back-office applications such as email and payroll systems to be consolidated, and the savings directed to ‘front line’ technologies such as e-learning, patient care and emergency services. That program was broadly viewed by the industry as problematic, with Edgecumbe having left his position after just two years in the role, and his successor, Emmanual Rodriguez, repeatedly refusing to communicate about the outcomes of the project. Rodriguez has stepped down from the CIO role. However, the AustralianIT reported in January 2011 that the so-called “People First” strategy had delivered about $523 million in savings in the long run, basing its article on an audit by consulting firm Ernst & Young of the initiative. 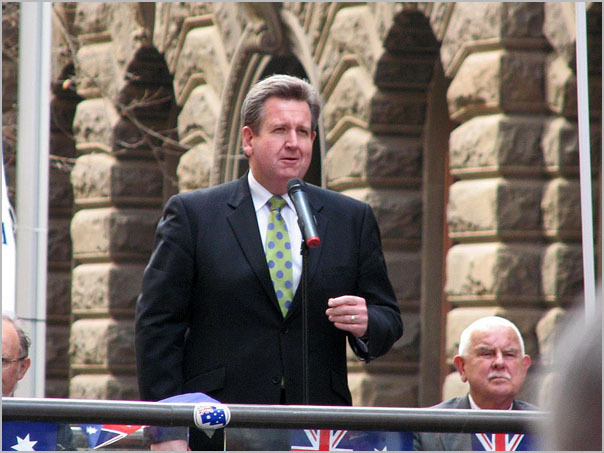 Prior to the NSW Election in late 2010 in which the Coalition took power from the long-serving incumbent Labor Government, then-Opposition Leader (now Premier) Barry O’Farrell (pictured above) had promised the Coalition would invest in technology solutions to solve state government service delivery issues if it was elected to power in the next election. O’Farrell said there was a great misconception that IT was simply a way to replicate offline transactions online more efficiently and at a cheaper cost. “However, it’s actually an opportunity to rethink how we transact in the first place,” he wrote at the time, giving examples of residents being able to renew public transport tickets online, more accurate patient care through e-health solutions and being able to renew a fishing licence on the same site as your driver’s licence. “A future NSW Liberal & Nationals Government is energised to embrace technology,” he concluded. At least one analyst has already praised the new initiative by the NSW Government. At first glimpse it all sounds positive and to be a step in the right direction. … stands on the NBN? I have asked Bazza and co about the NBN quite a few times over the past several years and gotten no real reply. Sounds good on paper – sensible and realistic. Lets hope it happens! When you say about the chair “formally the state’s chief information officer” are you saying that the state’s CIO is ex-officio the chairman of the Board or that Coutts-Trotter was formerly the CIO? What I’m saying is that Coutts-Trotter is officially the state’s chief information officer, but has no qualifications or experience in technology, and no doubt has little real-world impact in developing policies in the space. I’m saying that he’s a figurehead, and probably has more to do with approving technology policy and projects for the NSW Govt than actually developing them. I don’t feel the term CIO can rightfully be applied to him. I thought the Dept of Premier and Cabinet appointed a CIO (albeit on a temporary basis) earlier this year. That said, when the super-departments were formed, many of the roles that were held by high-ranking executives (like CIO, but some were legislative bound too) were given to the director-general of the new super-dept. Many have gone back to having people below the DG in those roles now. Why are there many older people in that photo – especially in the first person speaking? (no offense to any older generation) – But I deal with people every day in public having no clue on technical matters. The NSW Election was in March 2011, not ‘Late 2010’. Same old crap. Rebranded and repackaged. No real change. And as always, led by the clueless and incompetent.